Been looking about for N Gauge people. Shocked at the cost and seems mainly only painted available. I paint wargame figures to pay for my rail hobby so can easily handle unpainted. I'm after period figures for 30s/40s LMS/LNER but few seem to be available. Any ideas where I can get some at reasonable price for the period? Have you looked at P & D Marsh, Cudders? Preiser do bulk packs of unpainted figures. 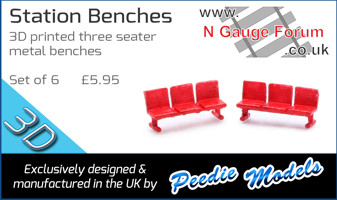 They are to European N Scale but this is an advantage if you are looking for seated figures to go inside a coach. Preiser do a few different unpainted packs of people at a reasonable price. Have a look at Modelu 3d. Not cheap but they look good and I've seen a few reviews. Both my sons were into Warhammer and Dad was called on to paint quite a few strange figures when they were younger. B H E have packs of the Chinese painted people they are in packs of 10 seated passengers at £1 allthough very brightly coloured they do show up well in coaches ,depending on what make of coach you might still have to cut off their legs to fit them in . If you want quite a few I’m sure Ray can offer you a discount . I think you'll struggle to find model figures that are readily identifiable as being of a specific era, other than uniformed figures. Would anyone be able to tell the era of a figure inside a N gauge coach? Figures posed outside (i.e. : on a platform) could be made more era specific by toning down colours for older eras and maybe adding a bit of modelling clay to lengthen and widen skirts. For inside coaches I use cheap Chinese standing people with there legs chopped off (not found a use for the legs yet!). May I suggest cudders uses the search function? Thanks for the advice chaps, apart from the one who didn't. Page created in 0.188 seconds with 42 queries.